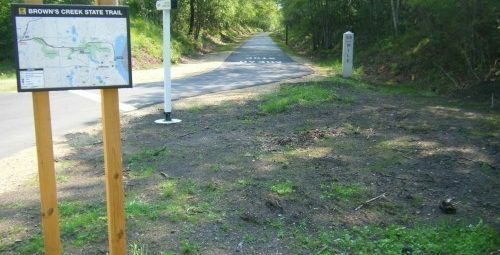 S aturday, June 6 from 9am – 1pm is the grand opening of the Brown’s Creek State Trail. The celebration will include five naturalist stations along the trail with activities to learn about the natural resources. The ribbon cutting will begin at 10am at the Stillwater trailhead and will include speaches, kids activities and music. 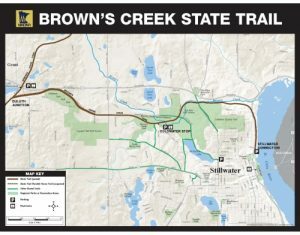 The 5.9-mile trail spurs off from the Gateway State Trail and follows the route of a former dinner train, which parallels Brown’s Creek and ends in downtown Stillwater. The land was acquired in 2012 in a rare opportunity to obtain the entire corridor from one landowner. Often segments must be purchased from many private landowners over years of negotiations. Work progressed in stages and was aided by the Gateway-Brown’s Creek Trail Association and other trail advocates helping to secure the funding required to remove the train tracks, build a bridge over the busy Manning Ave., and pave the trail. This was included in the Parks & Trails Council’s advocacy work for several years (see previous year’s legislative agendas for details). The trail will be a tremendous asset to the city of Stillwater, which already attracts many tourists. In addition, for trail-hardy residents of St. Paul there is now the option to hop on a bike and ride continuously on paved trail for about 15.5 miles into downtown Stillwater.